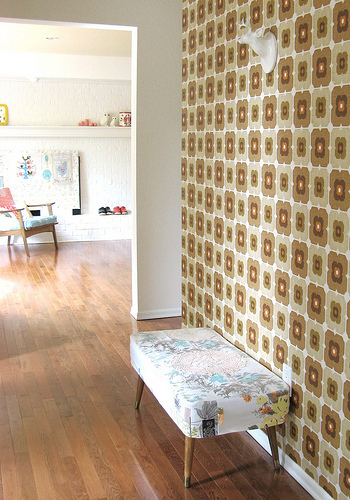 Since we have been on the subject of wallpaper this week, I thought this was a really great idea on the part of Tif over at Dottie Angel. 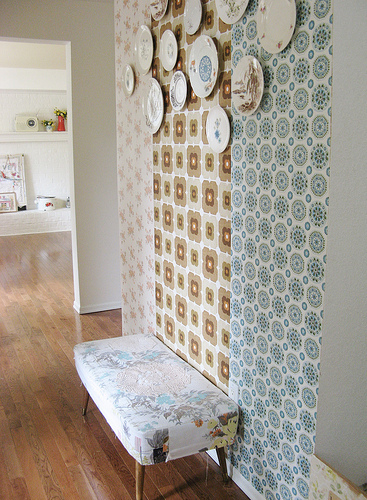 She put up three different strips of wallpaper to make a patchwork of sorts for her entry wall. How brave, and really kinda brilliant. It turned out beautifully! Check out all the details here. And, with that, I declare, wallcovering week over. 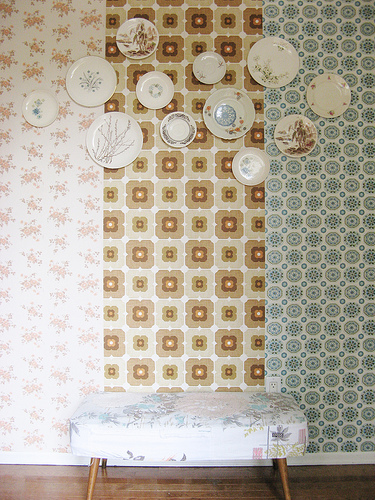 So, where do you all stand in the wide, wide world of wallcoverings? Which was your favorite. 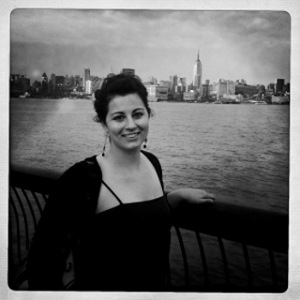 Might you find yourself undertaking one of these projects in the near future? Hope I helped clarify the options for you. Thanks for sticking with me during my exploration. We'll be back to regular programming next week. Have a great weekend everyone! and with this, you have REALLY covered the angles! Maybe upholstered walls, too? Love that. great ideas in this round up, thanks. My hubby is too terrified of wallpaper (I wanted a wallpaper feature wall behind our bed), but instead he settled on a stencilled wall... (sigh). It'll look nice, but it's still not the same. loving all the wallpaper info as i have wall i am about to attack.